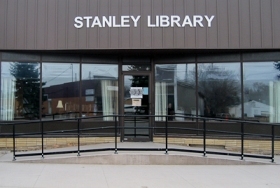 Nationally acclaimed author Lorna Landvik made a surprise visit to the Stanley Public Library on Tuesday, June 26. She is also an actor and a playwright and has appeared in many stage productions. Lorna is married with two children and was born in Grand Forks, North Dakota. She currently resides in Minneapolis and tries to write most every day.